This little girl's reaction to seeing a portrait of herself is too cute for words. Five-year-old Celia Furtado, who has Down syndrome, was diagnosed with B-cell lymphoblastic lymphoma earlier this year. She's lost her hair and a lot of weight, but recently she got to see a portrait of herself taken almost a year earlier and her reaction was priceless. "She spotted herself right away and she pointed and smiled," photographer Laura Kilgus told ABC News. Celia initially had her photo taken by Kilgus in conjunction with the Down Syndrome Society of Rhode Island. 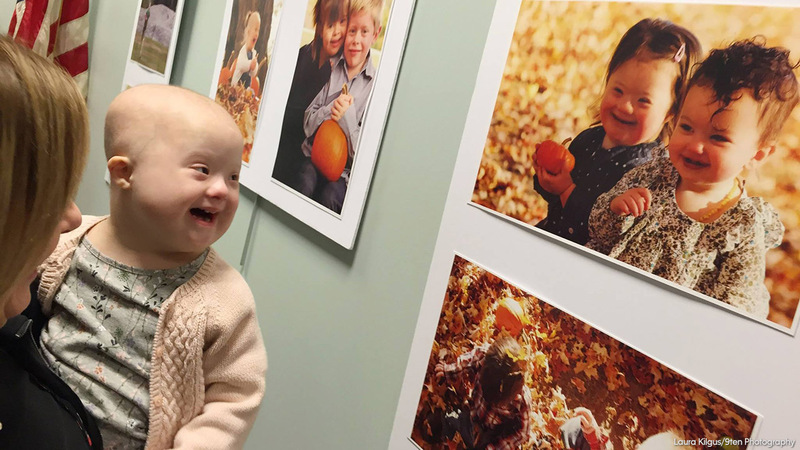 Celia's portrait, along with photos of other children with Down syndrome, were displayed during a gallery event for Down Syndrome Awareness Month last week. That's where Kilgus snapped Celia's reaction. "When she saw it, she started screaming and pointing to herself," Celia's mom Katie Furtado of Cranston, R.I., said. "I think the whole world looks at Celia differently now since she doesn't have any hair and she's lost a lot of weight, but I was relieved that Celia still sees Celia." Celia is undergoing chemotherapy, which will last two years. But, her mom says, the little girl is starting is starting to bounce back from the exhausting treatments. "A lot of her personality was put on hold for quite a few months, but like I said to someone the other day, 'She's back,'" Furtado said.